You have the freedom to choose your childcare provider. Any childcare facility licensed or registered with Texas Department of Family Protective Services (TDFPS) Childcare Licensing Division is eligible. You may also choose an eligible relative who is listed with TDFPS Childcare Licensing. For more information, please call 361.882.7491 or 1.888.860.5627. A Texas Rising Star (TRS) Provider is a child care provider that has an agreement with a Local Workforce Development Board’s child care contractor to serve Texas Workforce Commission (TWC) subsidized children and that “voluntarily” meets requirements that exceed the State’s Child Care Licensing (CCL) Minimum Standards. 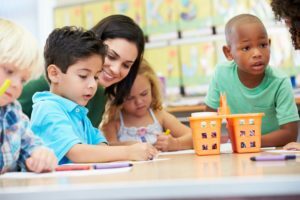 Child care centers and registered or licensed child care homes that meet the TRS Provider Certification Program requirements are able to improve and enhance the level of care they provide to the children and families they serve. There are 38 child care facilities with a TRS certification within the WFSCB’s 12 county region. There are three levels of TRS Provider Certification that are offered for licensed centers. How does the term “Quality Care” relate to Child Care Services? When the term “quality care” is used to describe child care services, it means simply that a child care center or registered or licensed child care home has exceeded the CCL Division’s minimum standards set by the Texas Department of Family and Protective Services. These providers have and continue to participate in “quality” professional development training activities provided by Workforce Solutions of the Coastal Bend (WFSCB). These training activities focus on the following quality initiatives: Early Literacy, Children with Special Needs and Directors Training.